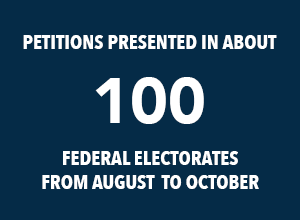 People across Australia have taken an offline petition around their communities to gather signatures calling on the government to commit to climate action. More than 25,000 Christians in Australia have signed the biggest faith-based, multi-electorate pen and paper petition in national history — calling for stronger action on climate change. We’d love to say a huge thank you to our amazing volunteers from TEAR Australia who collected hand-written signatures in their churches and communities, and presented petitions to their MPs. Please continue to pray as the petitions are presented by MPs and tabled in Parliament. 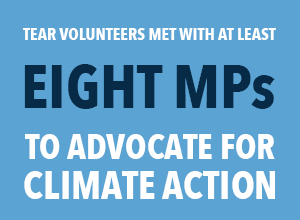 TEAR Australia will keep up the pressure on MPs to do all in their power to protect people and planet from the harmful effects of climate change.